Henry Kissinger is the most famous and most divisive secretary of state the US has ever had. In an interview, he discusses his new book exploring the crises of our time, from Syria to Ukraine, and the limits of American power. He says he acted in accordance with his convictions in Vietnam. 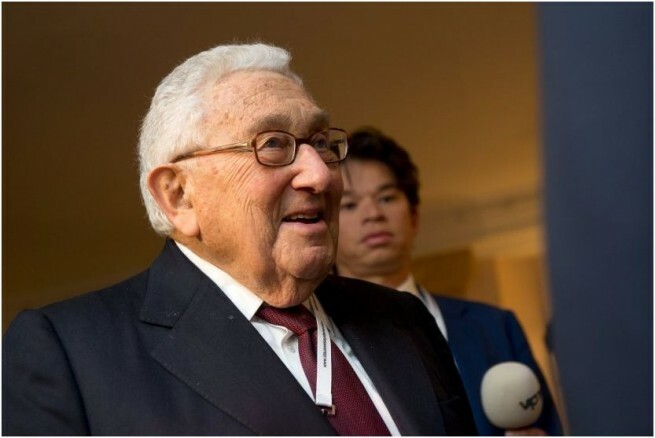 Henry Kissinger seems more youthful than his 91 years. He is focused and affable, but also guarded, ready at any time to defend himself or brusquely deflect overly critical questions. That, of course, should come as no surprise. While his intellect is widely respected, his political legacy is controversial. Over the years, repeated attempts have been made to try him for war crimes. From 1969 to 1977, Kissinger served under President Richard Nixon and Gerald Ford, first as national security advisor and then as secretary of state. In those roles, he also carried partial responsibility for the napalm bombings in Vietnam, Cambodia and Laos the killed or maimed tens of thousands of civilians. Kissinger also backed the putsch against Salvador Allende in Chile and is accused of having had knowledge of CIA murder plots. Documents declassified just a few weeks ago show that Kissinger had drawn up secret plans to launch air strikes against Cuba. The idea got scrapped after Democrat Jimmy Carter was elected in 1976. Nevertheless, Kissinger remains a man whose presence is often welcome in the White House, where he continues to advise presidents and secretaries of state to this day. Little in Kissinger's early years hinted at his future meteoric rise in American politics. Born as Heinz Alfred Kissinger in Fürth, Germany in 1923, his Jewish family would later flee to the United States in 1938. After World War II, Kissinger went to Germany to assist in finding former members of the Gestapo. He later studied political science and became a professor at Harvard at the age of 40. Kissinger recently published his 17th book, a work with the not exactly modest title "World Order." When preparing to sit down with us for an interview, he asked that "world order" be the topic. Despite his German roots and the fact that he reads DER SPIEGEL each week on his iPad, Kissinger prefers to speak in English. After 90 minutes together in New York, Kissinger says he's risked his neck with everything he's told us. But of course, a man like Kissinger knows precisely what he does and doesn't want to say. SPIEGEL: Dr. Kissinger, when we look at the world today, it seems to be messier than ever -- with wars, catastrophes and chaos everywhere. Is the world really in greater disorder than ever before? Kissinger: It seems that it is. There is chaos threatening us, through the spread of weapons of mass destruction and cross-border terrorism. There is now a phenomenon of ungoverned territories, and we have seen in Libya, for example, that an ungoverned territory can have an enormous impact on disorder in the world. The state as a unit is under attack, not in every part of the world, but in many parts of it. But at the same time, and this seems to be a paradox, this is the first time one can talk about a world order at all. Kissinger: For the greatest part of history until really the very recent time, world order was regional order. This is the first time that different parts of the world can interact with every part of the world. This makes a new order for the globalized world necessary. But there are no universally accepted rules. There is the Chinese view, the Islamic view, the Western view and, to some extent, the Russian view. And they really are not always compatible. SPIEGEL: In your new book, you frequently point to the Westphalian Peace Treaty of 1648 as a reference system for world order, as a result of the Thirty Years' War. Why should a treaty dating back more than 350 years still be relevant today? Kissinger: The Westphalian Peace was made after almost a quarter of the Central European population perished because of wars, disease and hunger. The treaty was based on the necessity to come to an arrangement with each other, not on some sort of superior morality. Independent nations decided not to interfere in the affairs of other states. They created a balance of power which we are missing today. SPIEGEL: Do we need another Thirty Years' War to create a new world order? Kissinger: Well, that's a very good question. Do we achieve a world order through chaos or through insight? One would think that the proliferation of nuclear weapons, the dangers of climate change and terrorism should create enough of a common agenda. So I would hope that we can be wise enough not to have a Thirty Years' War. SPIEGEL: So let's talk about a concrete example: How should the West react to the Russian annexation of Crimea? Do you fear this might mean that borders in the future are no longer incontrovertible? Kissinger: Crimea is a symptom, not a cause. Furthermore, Crimea is a special case. Ukraine was part of Russia for a long time. You can't accept the principle that any country can just change the borders and take a province of another country. But if the West is honest with itself, it has to admit that there were mistakes on its side. The annexation of Crimea was not a move toward global conquest. It was not Hitler moving into Czechoslovakia. SPIEGEL: What was it then? Kissinger: One has to ask one's self this question: Putin spent tens of billions of dollars on the Winter Olympics in Sochi. The theme of the Olympics was that Russia is a progressive state tied to the West through its culture and, therefore, it presumably wants to be part of it. So it doesn't make any sense that a week after the close of the Olympics, Putin would take Crimea and start a war over Ukraine. So one has to ask one's self why did it happen? SPIEGEL: What you're saying is that the West has at least a kind of responsibility for the escalation? Kissinger: Yes, I am saying that. Europe and America did not understand the impact of these events, starting with the negotiations about Ukraine's economic relations with the European Union and culminating in the demonstrations in Kiev. All these, and their impact, should have been the subject of a dialogue with Russia. This does not mean the Russian response was appropriate. SPIEGEL: It seems you have a lot of understanding for Putin. But isn't he doing exactly what you are warning of -- creating chaos in eastern Ukraine and threatening sovereignty? Kissinger: Certainly. But Ukraine has always had a special significance for Russia. It was a mistake not to realize that. SPIEGEL: Relations between the West and Russia are tenser now than they have been in decades. Should we be concerned about the prospects of a new Cold War? Kissinger: There clearly is this danger, and we must not ignore it. I think a resumption of the Cold War would be a historic tragedy. If a conflict is avoidable, on a basis reflecting morality and security, one should try to avoid it. SPIEGEL: But didn't the annexation of Crimea by Russia force the EU and US to react by imposing sanctions? Kissinger: One, the West could not accept the annexation; some countermeasures were necessary. But nobody in the West has offered a concrete program to restore Crimea. Nobody is willing to fight over eastern Ukraine. That's a fact of life. So one could say we don't have to accept it, and we do not treat Crimea as a Russian territory under international law -- just as we continued to treat the Baltic states as independent throughout Soviet rule. SPIEGEL: Would it be better to stop sanctions even without any concessions from the Russians? Kissinger: No. But I do have a number of problems with the sanctions. When we talk about a global economy and then use sanctions within the global economy, then the temptation will be that big countries thinking of their future will try to protect themselves against potential dangers, and as they do, they will create a mercantilist global economy. And I have a particular problem with this idea of personal sanctions. And I'll tell you why. We publish a list of people who are sanctioned. So then, when the time comes to lift the sanctions, what are we going to say? "The following four people are now free of sanctions, and the other four are not." Why those four? I think one should always, when one starts something, think what one wants to achieve and how it should end. How does it end? SPIEGEL: Doesn't that also apply to Putin, who has maneuvered himself into a corner? Does he act out of weakness or out of strength? Kissinger: I think out of strategic weakness masked as tactical strength. SPIEGEL: What does that mean for any interaction with him? Kissinger: We have to remember that Russia is an important part of the international system, and therefore useful in solving all sorts of other crises, for example in the agreement on nuclear proliferation with Iran or over Syria. This has to have preference over a tactical escalation in a specific case. On the one hand it is important that Ukraine remain an independent state, and it should have the right to economic and commercial associations of its choice. But I don't think it's a law of nature that every state must have the right to be an ally in the frame work of NATO. You and I know that NATO will never vote unanimously for the entry of Ukraine. SPIEGEL: But we cannot tell the Ukrainians that they are not free to decide their own future. SPIEGEL: You're speaking like a superpower that is used to getting its way. Kissinger: No, the United States cannot dictate, and the US should not try to dictate. It would be a mistake even to think it could. But in regards to NATO, the US will have one vote in a decision based on unanimity. The German chancellor has expressed herself in the same sense. SPIEGEL: America is very polarized. The level of aggression in the political debate is extremely high. Is the superpower still even able to act at all? Kissinger: I am worried about this domestic split. When I worked in Washington, political combat was tough. But there was much more cooperation and contact between opponents of the two big parties. SPIEGEL: In last week's elections, President Obama lost his majority in the Senate as well. Kissinger: Technically correct. At the same time, the president is freed to stand for what is right -- just as President Harry Truman did between 1946 and 1948, when he advanced the Marshall Plan after losing Congress. SPIEGEL: The next presidential race will soon begin. Would Hillary Clinton make a good candidate? Kissinger: I consider Hillary a friend, and I think she's a strong person. So, yes, I think she can do the job. Generally, I think it would be better for the country if there were a change in administration. And I think we Republicans have to get a good candidate. SPIEGEL: In your book, you write that international order "must be cultivated, not imposed." What do you mean by that? Kissinger: What it means is we that we Americans will be a major factor by virtue of our strengths and values. You become a superpower by being strong but also by being wise and by being farsighted. But no state is strong or wise enough to create a world order alone. SPIEGEL: Is American foreign policy wise and determined at the moment? Kissinger: We have the belief in America that we can change the world by not just soft power, but by actual military power. Europe doesn't have that belief. SPIEGEL: The American public is very reluctant to be engaged and would like to focus on domestic affairs. Obama himself talks about "nation building at home." Kissinger: If you look at the five wars America has fought since World War II, they all had large public support. The present war against the terror organization Islamic State has large public support. The question is what happens as the war continues. Clarity about the outcome of the war is essential. SPIEGEL: Shouldn't the most important objective be the protection of suffering civilians in Iraq and Syria. Kissinger: First of all, I don't agree that the Syrian crisis can be interpreted as a ruthless dictator against a helpless population and that the population will become democratic if you remove the dictator. SPIEGEL: But the civilians are suffering, however you define it. Kissinger: Yes, they are, and they deserve sympathy and humanitarian assistance. Let me just say what I think is happening. It is partly a multiethnic conflict. It is partly a rebellion against the old structure of the Middle East. And it is partly a sort of rebellion against the government. Now, if one is willing to fix all these problems and if one is willing to pay the sacrifices for fixing all these problems and if one thinks one can create something that will bring this about, then one can say, "We will apply the right to interfere," but that means military measures and willingness to face the consequences. Look at Libya. There's no question that it was morally justified to overthrow Muammar Gadhafi, but we were not willing to fill the vacuum afterwards. Therefore we have militias fighting against each other today. You get an ungoverned territory and an arms depot for Africa. SPIEGEL: But we are seeing a similarly unbearable situation in Syria. The state is falling apart and terror organizations are ruling large parts of the country. Wasn't it perhaps wrong not to intervene in order to avoid chaos that now represents a threat to us as well? Kissinger: In my life, I have almost always been on the side of active foreign policy. But you need to know with whom you are cooperating. You need reliable partners -- and I don't see any in this conflict. SPIEGEL: As in the Vietnam War. Do you sometimes regret your aggressive policy there? Kissinger: You'd love me to say that. SPIEGEL: Of course. You haven't spoken much about it all your life. Kissinger: I've spent all my life studying these things, and written a book about Vietnam called "Ending the Vietnam War" and many chapters in my memoirs on Vietnam. You have to remember that the administration in which I served inherited the war in Vietnam. Five hundred thousand Americans were deployed there by the Johnson Administration. The Nixon Administration withdrew these troops gradually, with ground combat troops being withdrawn in 1971. I can only say that I and my colleagues acted on the basis of careful thought. On the strategic directions, that was my best thinking, and I acted to the best of my convictions. SPIEGEL: There is a sentence in your book, on the last page, that can be understood as a kind of self-criticism. You write that you once thought you could explain history, but that today you are more modest when it comes to judging historical events. Kissinger: I have learned, as I wrote, that history must be discovered, not declared. It's an admission that one grows in life. It's not necessarily a self-criticism. What I was trying to say is you should not think that you can shape history only by your will. This is also why I'm against the concept of intervention when you don't know its ultimate implications. SPIEGEL: In 2003, you were in favor of overthrowing Saddam Hussein. At that time, too, the consequences of that intervention were uncertain. Kissinger: I'll tell you what I thought at the time. I thought that after the attack on the United States, it was important that the US vindicate its position. The UN had certified major violations. So I thought that overthrowing Saddam was a legitimate objective. I thought it was unrealistic to attempt to bring about democracy by military occupation. SPIEGEL: Why are you so sure that it is unrealistic? Kissinger: Unless you are willing to do it for decades and you are certain your people will follow you. But it is probably beyond the resources of any one country. SPIEGEL: For this reason, President Obama is fighting the war against terror from the air using drones and warplanes in Pakistan and Yemen and now in Syria and Iraq as well. What do you think about that? Kissinger: I support attacks on territories from which terrorist attacks are launched. I have never expressed a public view on drones. It threatens more civilians than the equivalent one did in the Vietnam War, but it's the same principle. SPIEGEL: In your book you argue that America has to make its decisions about war on the basis of what achieves the "best combination of security and morality." Can you explain what you mean by that? Kissinger: No. It depends on the situation. What is our precise interest in Syria? Is it humanitarian alone? Is it strategic? Of course, you would always want to achieve the most moral possible outcome, but in the middle of a civil war you cannot avoid looking at the realities, and then you have to make the judgments. SPIEGEL: Meaning that for a certain amount of time, for realistic reasons, we could be on the side of Bashar Assad fighting Islamic State? Kissinger: Well, no. We could never fight with Assad. That would be a denial of years of what we have done and asserted. But frankly, I think we should have had a dialogue with Russia and asked what outcome we want in Syria, and formulate a strategy together. It was wrong to say from the beginning that Assad must go -- although it is a desirable ultimate goal. Now that we are locked into that conflict with Russia, a deal regarding the Iranian nuclear program becomes more difficult. SPIEGEL: Are you in favor of a more assertive role for Europe, especially for Germany? Kissinger: Yes, certainly. A century ago, Europe almost had a monopoly in creating world order. Today, there is a danger it is just busy with itself. Today, Germany is the most significant European country and, yes, it should be much more active. I do have very high regard of Ms. Merkel, and I think she is the right person for leading Germany into this role. By the way, I've met and been sort of friendly with every German chancellor. SPIEGEL: Oh, including Willy Brandt? Kissinger: I have very high regard for Willy Brandt. SPIEGEL: We're a bit surprised here because a few months ago, a conversation between you and Nixon was released in which you call Brandt a "dangerous idiot". Kissinger: You know, these phrases out of context confuse the reality. Here are people at the end of an exhausting day saying things to each other, reflecting the mood of a moment, and it probably was during some difference of opinion which I don't even remember. We had some doubts about Brandt's Ostpolitik at the beginning, but later, we worked very closely with him. Ask Egon Bahr, he will tell you: Without the Nixon Administration, Brandt's Ostpolitik would not have achieved its objective, especially on the issue of Berlin. SPIEGEL: In Germany, you are a very controversial politician. When the University of Bonn wanted to name a chair after you, the students protested. Were you disappointed, or at least irritated? Kissinger: I appreciate the honor. I didn't ask for the chair, and I only became aware of the chair after it was established. I don't want to be part of the discussion, it's entirely up to German agencies. I think Germany should do it for itself or not do it for its own reasons. SPIEGEL: Mr. Kissinger, we thank you for this interview.